J.T. 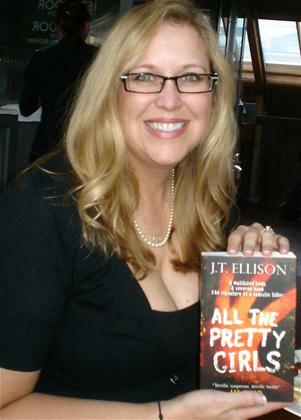 Ellison is the bestselling author of the critically acclaimed Taylor Jackson series, including All the Pretty Girls, 14 and Judas Kiss. She has worked with the Metro Nashville Police Department, the FBI and various other law enforcement organizations to research her books. Ellison is a member of several writing organizations, including International Thriller Writers, Mystery Writers of America, Romance Writers of America and Sisters in Crime. I kid you not, my career started because of a dream. A nightmare, really. I woke in a sweat, completely engrossed in the lives of identical twin sisters. It was 3:00 a.m. and I scribbled away until I had it all on paper, then went back to bed. When I woke up, it was still fresh in my mind. I started writing All The Pretty Girls that day, knowing that it was different. Special. It was only my second attempt at a full-length novel, but I knew it would work. I had faith. The dream had given me all the answers. All The Pretty Girls is the story of a reluctant serial killer, one who has the best intentions and motivations for his actions, and introduces Nashville Homicide Lieutenant Taylor Jackson and FBI profiler John Baldwin. Taylor and Baldwin chase the Southern Strangler all over the southeastern United States, trying to catch a killer who identifies his victims with classic love poems by Wordsworth, Blake and Coleridge. He defiles their bodies by cutting off their hands, then sends clues to a local reporter. It’s definitely a thriller, but not your typical serial killer novel. It’s all about the psychology, for me, not the titillation of violence. I love to figure out what motivates people to do things, and the Southern Strangler’s motivations, while originally pure, are perverted by his desires. When I was younger I studied psychology, even thought about a path in psychiatry for a brief moment (the whole med school cadaver thing was too much for my delicate constitution to handle.) Then I got caught up in the thrill of politics and veered away from that path. Finding it again through writing has been one of my greatest joys. I like to listen to people, to see what’s behind the words, the façade. Everyone has a secret, a shame, a motivation for their public persona. The same goes for a criminal. How do they decide that taking the easy way out is their purpose in life? What catalyst drives their break from good to evil? Where in their psyche does it say that cheating and stealing and murdering is good, and right? When do they proceed to choose that path? Choices… for me it’s all about the choices people make. And for every villain, you must have a hero. In my stories, it’s Lieutenant Taylor Jackson. Taylor is in charge of Metro Nashville Homicide. She’s a Nashville girl, born and bred. A debutante, even. She grew up in Belle Meade, the wealthiest part of town, with every imaginable advantage, yet she eschewed her parents’ lifestyle to become a cop. Her mother is a socialite and her father is a white-collar crook, so they have no great love for Taylor’s calling. What’s worse, Taylor’s love interest is Dr. John Baldwin, an FBI profiler. Though he is a doctor, it’s not exactly what her mother had always dreamed of for her only daughter. Taylor’s duty is to keep Nashville safe. She is an embodiment of my own hero complex – the white knight who appears on the scene, solves everyone’s problems, saves the day, then rides off into the sunset. She was born because of John Sandford’s PREY series. I was driving down Interstate 40, thinking about Lucas Davenport’s icy smile that didn’t quite reach his eyes, and that scar, and his depression, and realized I wanted to write about a woman in his shoes. A woman in control, who’s strong without being strident, who commands the respect of her peers and her enemies. One who’s worked hard and paid her dues. Taylor literally leapt fully formed into my mind, talking in that low, smoky drawl, and I was hooked. I knew I had to tell her story. She’s half cop, half rock star to Nashville. She’s a wonderful character to write – difficult, sometimes, but a lot of fun. My Athena. Nashville’s Athena. I also wanted Nashville to be a major character in my books. We have big city problems, the same kind of crime as New York and LA. I moved to Nashville in 1998, and I fell in love with the dichotomies, the sights and smells and its unique Southernness. All that constrained politeness; it’s the perfect setting for murder. I had a major roadblock to writing the story—I knew nothing about being a cop. My expertise was fully informed by Law & Order. I needed to do a great deal of research so the characters would ring true. So I called down to my local homicide office, chatted up the kind detective who answered the phone, and finagled a ride-along invitation. Metro Homicide has been overwhelmingly open with me, allowing me to ride along several times, setting me up on midnight patrol, everything. I couldn’t have made these books half as realistic without their help. I did several ride-alongs with homicide and went out on midnight shift patrol. It was incredibly eye opening. I learned very quickly that television and movies and novels romanticize police work. My first night with Metro Homicide was spent looking at autopsy books, talking about real guns that kill real people, the drugs and prostitution and murders that go unnoticed by the press every day. I was overwhelmed, and knew I had my impetus. I’ve gone along to serve a warrant, interviewed prostitutes—taking physical descriptions so they could be identified when they were found dead—been first on the scene of a stabbing. It was bad, blood everywhere, his family crying… you can imagine how shocking it was. We caught the suspect, retrieved the murder weapon, then transported him to the Criminal Justice Center in the backseat of the patrol car—a killer, literally breathing down my neck—and took him to booking. The man he stabbed died. When I got home, at six the next morning, I saw I had his blood on my cowboy boot. It’s hard not to get earnest about the job our law enforcement does after that, and it had a huge impact on my writing. I want everyone, from laypeople to law enforcement, to read my books and think – hey, that’s just how it’s done. My research had led me to Tennessee’s forensic odontologist, who did identifications in New York after 9/11, to the Manhattan Medical Examiner’s office, to forensic anthropologists trying to identify year-old remains, to Interpol and New Scotland Yard and the Italian Carabinieri, and finally, to the FBI. It’s very important to me. To be honest, research is one of the best, most exciting aspects of this job. Aside from titling, that is. I love to title, and All The Pretty Girls was no exception. All of my books are steeped in mythology and fairy tales; the titles rise out of the books thematic foundation. All The Pretty Girls was a combo platter: a Grimm Brothers tale called Jorinda and Jorindel, and the old nursery rhyme: “Mary Mary, quite contrary, how does your garden grow? With silver bells and cockle shells, and pretty maids all in a row.” The image of the growing garden was especially important to the story. They say it takes a village, and for a debut author, that’s the absolute truth. I’ve worked with a critique group since 2005, and I was lucky enough to be mentored by a couple of brilliant writers: John Connolly, who saved me from giving up when he told me that all good books find a home, and Lee Child, who was always willing to listen, suggest and mentor, for which I am eternally grateful. Lee’s advice on promotion and how to keep a series character fresh and exciting has been invaluable. His obvious discipline and “help others” attitude is a standard I try to hold myself to. He teaches by example, which is rare in a world where competition is paramount. I had a dream. It had some twists and turns along the way, but, strangely enough, it came true.